Beltane’s nearly upon us, and Alison Lilly’s most recent blogpost “Holy Adoration: Fire as Prayer” catches the energy behind this fire festival. For it is after all the day of the Fires of the Celtic solar god Bel, as even a traditional source like the BBC calmly informs us on their website. Some seasons you’ve just had enough of the world, and most of all yourself as a tame fire, to paraphrase Alison. Do check out her blog. She evokes and invokes Beltane in a personal and poetic meditation. You too may long to spark, flare, burn and roar. Heap the kindling of my life and ignite, you whisper — or shout. Beltane is here for you. Part of the Bardic training of Druid groups like OBOD and others, and much of the initial work in the outer grades of the magical Order of the Golden Dawn focuses on exploring and balancing the elemental energies flowing in and around us. We don’t — normally — want to burn up or out. But a healthy conflagration may burn off the wintry torpor that clings to our mood and outlook. Beltane is tonic, purgative, exhiliration, ignition. The symbolism of the four physical elements of earth, water, air and fire persists in the cultural and magical imagination of the West because they express important truths about human life. They serve as a powerful shorthand for a whole cluster of ideas, images, experiences and memories, and their presence in ritual and story, song and myth will endure as long as we inhabit the same worlds where they manifest. Their existence as physical entities endows them with the further potential to serve as sacraments. As always, though we keep forgetting, reverence and engagement are our choice, an opportunity like any other that we may welcome or reject. Here, too, fire can kindle us to possibility and change. 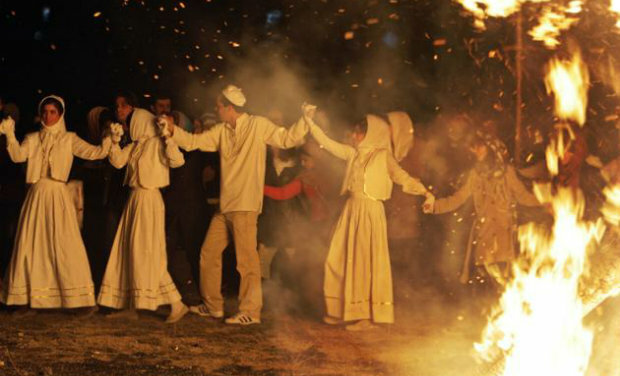 Further afield from Celtic-flavored European Druidry, fire is also central to the religious practice of Zoroastrians, the people popularly known as Parsis. Their Fire Temples offer just one more illustration of why reducing fire to an explanation like “rapid oxidation in an oxygen-rich environment like earth’s atmosphere” says nothing about our actual experience of fire, its light and warmth and flickering presence, and its long association in human consciousness with spiritual reality, energy and life. Anyone who’s experienced a good bonfire knows this to some degree. It’s our human art to extend these experiences and celebrate their effect as spiritual opportunities for transformation and joy. Fire calls to ancestral human memory. Cultural practices and beliefs that center on it only endow it with additional significance and power. Druids may say as part of ritual “Let us pray with a good fire,” an invocation traceable to the worship of the Hindu Agni and a hymn in the Rig Veda (Bk. 1, 26). And Wendy Doniger in her translation* notes that “When Agni becomes the priest, his robes are both the flames and prayers.” Thousands of years of human experience with fire has not dulled its power. *Doniger, Wendy. The Rig Veda: An Anthology. One Hundred Eight Hymns, Selected, Translated and Annotated. Penguin Books, 1981, pg. 100. My relation with fire is a difficult one. I’m very prone to burning up and burning out and getting burnt. I found it very difficult writing the intro to the new Gods & Radicals Beltane journal ‘The Fire is Here’ – as a winter/cold/darkness person it was very difficult. I do like Alison’s line ‘Sometimes what I want is to give my whole life over to this adoration, to the hunger of the ones I love.’ It captures not only fire but the nature of devotion.